Join Fern and her pals on a journey to make cool interactive projects and learn circuits and programming along the way. You’ll learn to make LED lights shine and blink with loops and variables, craft paper switches and program them with conditional statements, and make complex light patterns with multithreaded programming. Finally, level up your coding skills with our debugging chapter, which shows you how to find and fix problems in projects. With Love to Code, everyone can create stories with circuits and code! Order Love to Code Creative Coding Kit! Already have your kit? These tutorials will help you get started! Use our text editor or block editor to program your Chibi Chip! If you would like to start with text-based coding, try using ChibiScript, an Arduino-based beginner-friendly coding language. 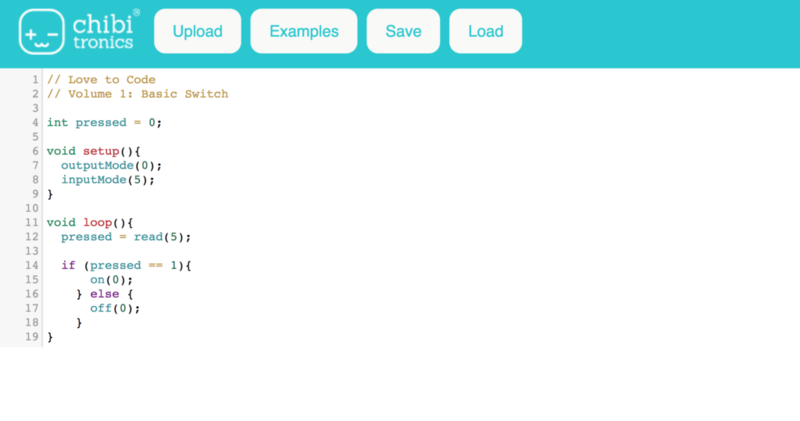 You can code directly in Arduino programming language with this text editor! 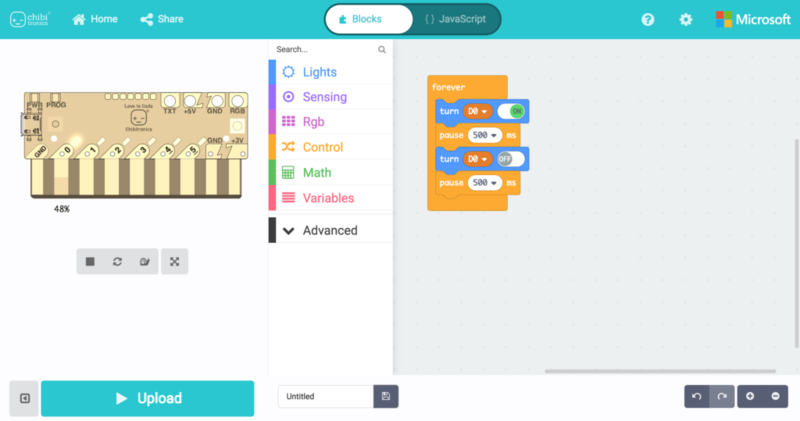 If you’re new to code, try our Scratch-inspired block code editor by Microsoft MakeCode! We’ve adapted Love to Code Vol 1 to the MakeCode editor. The adaptation is free for download here! Already have a Love to Code kit? Here’s how to get started! You can power your circuit with the Love to Code binder, or any other USB power supply. This tutorial shows you how to upload code from the code editor to your Chibi Chip! Not sure how to complete a chapter? Stuck on a technique? Check out these companion video tutorials for the activities in the Love to Code Book! What can you do with Creative Coding? Love to Code Vol 1 is made available under a CC BY-SA-4.0 license. 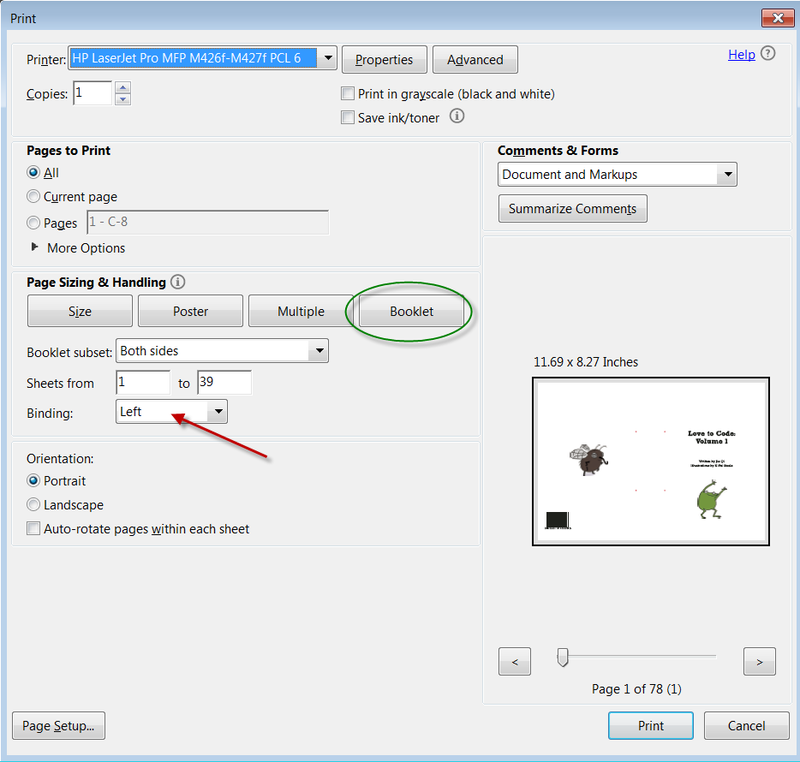 This means you are free to download, copy, print, translate, and remix elements of the book. 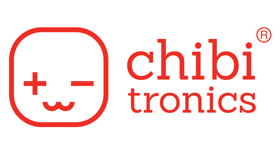 We only require that you attribute Chibitronics, and that any derivative works (such as translations and lesson plans) also use the same CC BY-SA-4.0 license. Please click the CC icon for more details on the license. Here’s a presentation detailing the specs of the board, our design philosophy, and how it works. We presented it at the 33rd Chaos Computer Congress. Our hardware designs are open source. This means there is no limit on how deep you can go. If you get started with Love to Code, there is no stopping you: you are empowered to remix our hardware and software into your future products! Our only requirement is that you share your derivative works using the same license as ours. That way, others can also learn and benefit from our collective efforts. Curious? Check out the operating system running on the Chibi Chip, its circuit diagram, or its web-based code editor. You can even check out the source code for Microsoft’s MakeCode editor! Because all of our source repositories are hosted on Git, it’s easy to contribute! Feel free to file issues and bug reports in the respective repositories, or make pull requests.